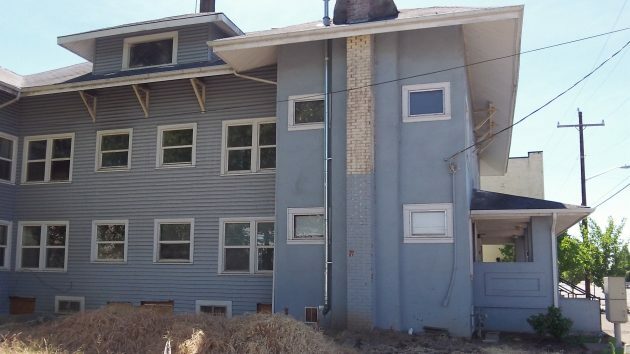 In six years this apartment building, empty for now, will be 100 years old. We drive by this place on Albany’s First Avenue S.E. all the time. But I had not noticed it was vacant until I rode it past it, slowly, on my bike last month. It’s been empty since last year, I learned from Scott Lepman. His company, Glorietta Bay LLC, bought the place in January 2015 for $214,000, according to the online records of the Linn County tax department. The records also say that this apartment building was built in 1922. The tax assessor thinks it has a real market value of $346,510, but its maximum assessed value last year was $205,490. There are two stories and a basement, totaling about 10,600 square feet, and the photo makes it appear there is an attic as well. Lepman was one of the people attending a City Hall meeting on downtown development Monday, and I had a chance to ask him about 222 First Avenue East. Over the years the place had acquired kind of a threadbare look. The new owners are talking with an architect. They intend to renovate the place and modernize the 19 apartments inside. You’re missing the important issue, Hasso. WHY ARE THERE A BILLION WINDOWS ON THAT PLACE?? For residents to look out? For light to come inside? To keep the rain out and let sunshine in? Want more? Better question might be — “what is its history?” It reminds me of a rooming house or a hotel. Perhaps the answer man can check next week. I would like to know the history as well. I have heard there are several haunted buildings downtown, could this be why the building has been empty for a year? Judging by all the sketchy people who used to hang out on the porch a few years back, asking passing people for money and/or cigarettes, I’d say it used to be some kind of halfway house or just really really cheap rooms. I started taking a different route home because the staredowns from those people was a little uncomfortable. Seems like they were working on the foundation a year or two ago (or maybe they were just fixing a collapsing basement wall or something else), right around the time they chopped the giant tree next to it down. That’s also when they tore up the city sidewalk in front, which still hasn’t been fixed.